Sometimes, adult survivors of emotional child abuse feel a deepening sadness that grows heavier and heavier with time. The burden of it can feel too much to carry… and they may think about suicide. So, we need to talk about suicide… and to discuss it with compassion and without judgment. Let’s drag this howling monster from the shadows and force it to the spotlight, so we can see what it truly is and talk about finding help to battle suicidal thoughts. Don’t be afraid to discuss this subject. The mention of the word “suicide” will not summon death. It is not an evil spell that a person can cast. Most importantly, we can weaken suicide’s seemingly overwhelming power when we discuss it and seek healthier solutions for such severe depression. After all, suicide is a tragic death… and yet it can be preventable. 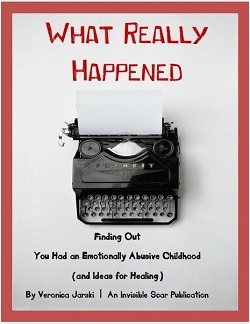 An adult survivor of emotional child abuse will grow weary of the battle to be authentic. Aching from emotional bruises, worn from the childhood memories, feeling alone in the truth, some adult survivors want to die. There. I said it. Sometimes, people wish they were dead, so everything wouldn’t hurt so damn much anymore. That’s a fact that wails from emails some readers send to me. But it’s also a fact that this feeling doesn’t last forever. The sorrow and the hurt and exhaustion may feel endless, but it will pass in due course, no suicide needed. At its core, suicide is about someone ending his or her life because life feels too painful. The road may be darkened and difficult, but don’t walk it alone. Find someone to talk to. Seek help. Keep moving, pausing when you need to, but do not make that pause a stop. You may feel alone right now, but you aren’t. Even if you look around your life right now, your heart breaking inside your chest, your head full of storm clouds, your eyes unable to see the light, you are not alone. Every single night, I pray and hold in my heart all the readers of The Invisible Scar. I pray for you, want the best for you, desire your healing. I carry your heart in my heart, as the poet e.e. cummings wrote. Your fellow adult survivors of emotional child abuse here at The Invisible Scar care about you, too. Our narratives share much in common, despite the uniqueness of each person. And we all understand sorrows. You can also find comfort on The Invisible Scar Facebook Page. If you’re in despair and feel alone, you can post there. We’ve gathered on this online prairie, listening to the howls of wolves in the distance, looking at the sky for signs of hope in better things ahead, plotting our next trails… and we also warm ourselves by the bonfire and tell our stories and share our griefs and celebrate our victories. You’re not crying into the wind. We are listening. And He who created the world also hears you. God is here, though you may not feel Him right now. And if you are despairing about your upbringing or current situation, God will not be mad at you. He’s not pissed off that you’re contemplating suicide. He’s not rolling His eyes at your despair or just waiting to condemn you. A good, good father would never reject a child who is hurting. And though your earthly parents have proven cruel or empty, your true Father is always there to hear your prayers, the whispers that you cry into your pillow. He loves you so very much. Give yourself time. If you feel like killing yourself right now, wait rather than act on that impulse. Stop. Give yourself another day, a week, a month. Focus on something else for the next hour… Then, the next. Hang in there. People do overcome suicidal thoughts and get better. You can get help and learn to banish that darkness. Feelings pass. They might not feel like they do, but feelings do change. None lasts forever. You are irreplaceable. There is only one you in the world, and we need you here. Stay with us. “Man exists as a unique and unrepeatable being,” writes the Pontifical Council for Justice and Peace. We need your uniqueness. Don’t go so early. Now, please go talk to someone who can help you. If you’d rather not call but would prefer to email, then email the Samaritans immediately. If you know someone who is contemplating suicide (or you suspect that he or she is), prepare to talk about suicide and then start the conversation. A person thinking about suicide (whether the thoughts are periodic or constant) often talks about feeling hopeless, about despairing, about the seemingly endless suffering. We must listen to this person. We need to listen to one another when we talk about the darker feelings inside us. When I was a teenager, a girl in my freshman gym class committed suicide. Sheila* had a lovely cheerful face, freckles sprinkled liberally over it, and shining sky-blue eyes. Petite, round, and golden-haired, she reminded me of an extra from an old “Gidget” movie, everything sunshine and bright. But Sheila was being ravaged by depression, and I never knew it. One morning in March, after gym class, she gave me her lime-green bead necklace. I had said it was pretty, and she had hesitated then taken it off and insisted that I keep it. I put it on immediately, struck by her generosity and sweetness. The next day, our teachers told us all that Sheila had killed herself. She hadn’t made it to her fifteenth birthday, just three months away. Perhaps whatever sorrow Sheila held, whatever despair she felt, would have passed by now, still having left its scar on her but not permanently slaying her. News of her suicide tore through our high school like a monster from a nightmare. Teachers showed us after-school specials about suicide and urged us to seek help; they were so afraid that Sheila’s suicide was somehow catching. Her death was the topic of conversation for days. A few students lacked compassion and were cruel about how “only losers killed themselves.” But a lot more of us were quiet and scared, wondering whether our sorrows would turn into monsters, too. The realization I had then—and that remains with me—is that all types of people commit suicide. Young people. Old people. Rich people. Poor people. But they don’t have to commit suicide, they don’t have to give into despair. Suicidal thoughts can be overcome. Please, don’t take your life. Things may seem dark, tragedies may feel insurmountable, but suicidal thoughts are treatable. “Others have experienced suicidal thoughts and go on to lead fulfilling lives after seeking treatment,” writes Margarita Tartakovsky, M.S., at Psych Central. Please seek help. Show a trusted person where the shadows are so he or she can help you find the light and emerge from the darkness. What a fabulous insight into not only, how people may be feeling, but how we can support them. I work with primary school children (4 – 11 year olds) and see more and more children who are ravaged by anxiety and depression and have suicidal thoughts as young as 8. Thank you for sharing. You’re very welcomed… Glad to be of help. The heart hurts to hear that such young children are having suicidal thoughts, but, yes, we do need to help others find healing, find the right way to battle such thoughts. Such depression and anxiety isn’t just for adults; it deeply affects young children and teens as well. Best to you in helping schoolchildren. I thought about it & then realised if I did it would be more ammunition to dirty my name, you can imagine, “oh yes, she was always unhinged” I wouldn’t give them the satisfaction. It does feel at times hopeless, some days are better than others, but we must embrace love, light and move forward in peace-embrace everything they hold in contempt, the hate must die with them. Reblogged this on survivor road. Veronica, another outstanding post! 29 years ago I lost my 18 year old brother to suicide. Our family situation was so chronically toxic that hope scarcely had a chance to survive in our family. The kindness of caring friends was insufficient to rescue my brother. All the “what if’s” haunted many people close at hand. The only person who didn’t seem to struggle with this was our father – who was our abuser. Ironically, we don’t know how often we may have been the kind person who spoke just the right words at the right time to change the trajectory for someone at a point of despair. Each kind act has the potential to make a difference. Your words bring hope and healing. Thank you! I am so, so very sorry for your loss. The what-if’s can be terrible indeed… I felt haunted for quite a long time about Sheila’s death, and it’s still with me in a way, an experience etched in my heart. Suicide is a very difficult subject, but we lose nothing in talking about it and can gain so much. I too am very sorry for what has happened. I hope you’re alright. Reblogged this on The Current Collective. Youve put into words what I’ve been feeling since I became an “adult” 13 years ago. The tiny bit of weight that that statement lifted off my soul has much more of an impact that I would have thought. I’m not alone nor am I abnormal. No, you are not alone, Jessica. And we’re so glad you’re here. Very thoughtful article but I would question the use of the words, ‘ they don’t have to give into despair ‘. When someone has reached the point of suicide, despair is not some passing emotion that can be put down and disposed of. It has become a part of that persons being, perhaps over many years. Suicide is not ‘giving in to despair’. It is the last desperate attempt to remove despair from life. Despair is an emotion that I have put down in the past and I’m grateful I did. We are not our thoughts. Many, many people have met a turning point and have even been enlightened by hitting this very dark place and having not giving into despair have healed in a way they never knew possible. Despair can very much be a passing emotion and I think its very important for people to hear that. Veronica, God bless you for this. This has to rate as one of the most compassionate articles on suicide. In my own abuse experience, I contemplated suicide many times, but thankfully, nothing went through. Still, had I read this during those dark years, it would have brought the sun back into my life much earlier. And much stronger. When the days get too dark, I pray today that other sufferers find you, this and other articles here, and go on to find God. I am now more alone than ever. Ever since I stopped being the provider of help, there’s been a stready torrent of accusations from everyone I’ve helped of selfishness, willful ignorance of their pain, a complete lack of sympathy for them and an intentional refusal to acknowledge that EBERYBODY IN CASABLANCA’S GOT PROBLEMS. So on ad nauseum. The person who became an addict after 23 years of friendship is not the same person I knew. Before his addiction, he was acknowledged even by people who disliked him as loyal, compassionate and truly generous in every way. When my dad was dying neither my husband nor I could drive almost 50 miles (& back) to Dad’s house. He needed both knees replacee & I’d had one knee replaced and surgery to repair massive damage to my shoulder and adjacent muscles and bones was two weeks away. My friend came 20 miles north to pick me up, and drive 50 miles south to and from Dad’s house before going home (20 miles south). That’s only one of hundreds of kindnesses I’d seen him perform, not just for me. He was truly in pain before and after the surgery. He was a victim of the DEA’s program to put fear into doctors who wrote Rx’s to alleviate pain even for terminal cancer patients. When I couldn’t do anything to help ease his pain any more, he stopped contact. My only-child husband (just like my mom & my siblings!) said I must be mistaken, there had to be more to story, there HAD TO BE SOMETHING I HAD DONE to break up a 23 year old friendship. (Like the time he advised me to write letters to my brother and sister to ask why I was always out of the loop. Nobody could ignore a handwritten snail mail letter exposing such pain & vulnerability. WRONG.) He pushed me into talking to this guy asking him to come here. And the instant he arrived & went to the man cave, he demanded “help” from husband immediately or he’d turn around and leave! AYKM? YamIhere wasn’t misunderstanding, her perceptions weren’t off base, everything she’d said was not only correct – she had not revealed the extent of the change. How am I not alone? I was thrown tidbits of gratitude or affection as long as I was useful – as long as I was the caregiver. The moment – and I mean that literally – I was the one who needed help, could no longer care for “family and friends” I was NOBODY. I wasn’t surprised. I didn’t expect anyone to change, and they didn’t. I HAD hoped to find a paid professional, given how much I pay for benefits through my employer, but I was wrong. I live the most populated county west of the Rockies, so you’d have thought there would be at least one. WRONG. I can’t pay cash. Too bad. I’m on my own. By the way, YamIhere, I need you to do (this) for (insert anybody’s name here). What do you mean you can’t? Did anyone ever tell you you’re a selfish bitter witch? Did you know a veteran takes his/her own life every 65 minutes? When I was 16, my 13 year old brother killed himself. Shortly afterward my mother told me she “wished it was me that killed myself”, “it was all my fault”, “it was because of me”, you get the point. I tried reasoning that she is in grief. When I brought it up a couple years later, she said she didnt remember saying any of those things. Well, just recently on his Birthday, several family members, and his friends were telling funny stories about him on FB. 2 days later, she again said those same things (its been 23 years) and I was shocked. I have kept her at arms legnth due to the repeated abuse. When people responded to her that she was crazy, and it couldnt be further from the truth, she started threatening to kill herself. This was all public, saying this to the same people sharing how they miss her Son that killed himself.. it was toi much. I had to delete it, so she could not inflict any more pain. Even as a adult, its just the same as when I was a young child. A Narcissist will never be healed. I dont know if I will ever forgive this last one. Its the biggest dagger, and it also proves to me that she meant what she said all those years ago, and she probably did remember. I wanted to believe that we can “work it out” more than seeing the truth. Now, I am finally understanding for the first time, it really isn’t my fault. I wasnt a “evil” child. I was probably reacting to scary situations, daily.